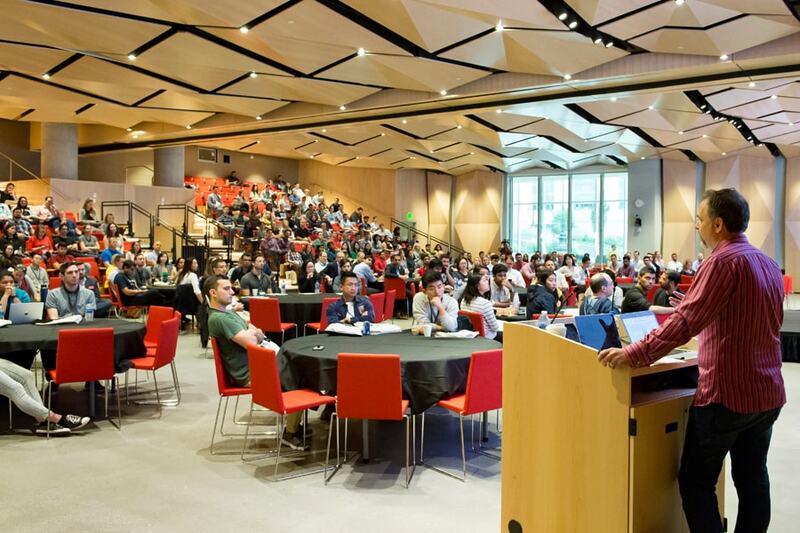 Carnegie Mellon University and the University of Pittsburgh hosted the first ProductCamp Pittsburgh Saturday, Sept. 22 at the Tepper Quadrangle, where more than 260 attendees from around the region came to learn from nationally recognized experts in product management. ProductCamps, free gatherings trending worldwide, focus on developing and bringing new products to market. They tout an "unconference" format in which participants forgo an agenda and cast votes in real time about what they want to discuss next. The process aims to elicit feedback, a basic tenet of product management. "ProductCamp Pittsburgh provided so many diverse perspectives. I met students, entry-level professionals, senior directors, entrepreneurs and professors from many disciplines all in one short day," said Amy Super, product experience director at Confluence. CMU's Greg Coticchia led the event team, with support from the Integrated Innovation Institute and Pitt's Innovation Institute. Organizers came from CMU and Pitt, as well as Bally Design, Bayer Health Care, pHase2 microtechnologies, Smart Hammer Innovation and Zoll Lifevest. The all-volunteer effort took six months to plan and attracted corporate sponsors. Coticchia is the executive director of the Master of Science in Product Management (MSPM), a joint program between CMU's School of Computer Science and the Tepper School of Business. "Events like ProductCamp Pittsburgh will inspire existing product managers to be better, and those that want to be product managers to get involved and be a part of the community," Coticchia said. Students, including Murtaza Nasikwala, a first-year MBA student, made up one-third of the attendees and were among the 29 volunteers who helped run the event. "Something students think about is customer discovery, or how to involve diverse groups of people in developing new ideas and features... It's not as easy as sitting alone in a room and coming up with a product," Nasikwala said. Three product management thought leaders gave keynote presentations. The morning featured Eric Boduch, a 1996 graduate of CMU's Department of Electrical and Computer Engineering, a contributor to ProductCraft and the Product Love podcast. Boduch and a fellow ECE graduate co-founded the software company Pendo to develop product management tools. The company has grown to 250 employees in five years. The afternoon offered talks by Steve Johnson, founder and CEO of Under10 Consulting, and Jeff Lash, vice president and group director at SiriusDecisions. Johnson entered product development in the 1980s at a time when product managers were self-taught and mentored. Professionals now have access to tools and education. "Product management, this profession of guiding what products we develop, is coming into maturity," Johnson said. Glassdoor ranked product manager ninth among the best jobs in America for 2018. "Many successful product management leaders — especially at startups — are like the new rock stars. People admire them and want to become product managers because of them," Lash said. The skills are needed in Pittsburgh, where the innovation economy is getting noticed by people like Phil Marzolf, an entrepreneur-in-residence at PItt. "I lived in the Bay Area for 20 years and never once felt goosebumps about being there physically, but I've had that feeling three or four times since moving here," Marzolf said. Attendance at ProductCamp Pittsburgh exceeded expectations for a first-time event. "Pittsburgh continues to become a 'product and innovation town' with the presence of Duolingo, RoBotany, Bellefield Systems and other success stories," Coticchia said. "ProductCamp legitimizes the strength of similar tech-based company in Pittsburgh, and CMU is at the forefront of educating product leaders with several degrees that emphasize technology and business, such as the new MSPM degree." Coticchia said the demand for product managers has never been greater. "'Product' isn't what's happening just in Silicon Valley or Silicon Alley; it's big and getting bigger in Pittsburgh," he said. Eric Boduch, a 1996 graduate of CMU's Department of Electrical and Computer Engineering and chief evangelist for Pendo, was the keynote speaker for Pittsburgh ProductCamp.